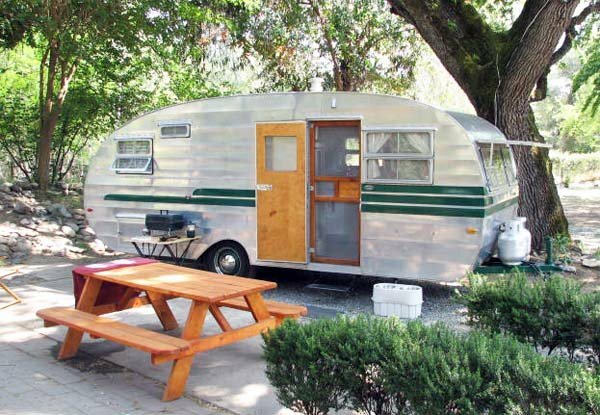 'The Vintage Trailer Hitch-Up,' amidst the trees of Bothe-Napa Valley State Park, will be a chance to experience a dozen classic travel trailers up close. The event takes place this Saturday August 22. About a dozen classic travel trailers will open their doors for the public to visit during a Saturday, August 22 fundraiser for Napa County Landmarks. 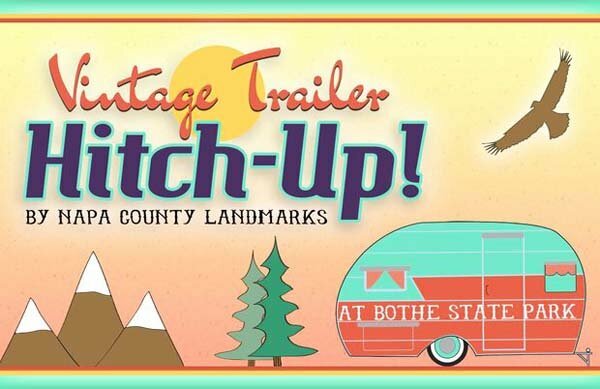 The event runs from 10 a.m. to 5 p.m.
'The Vintage Trailer Hitch-Up' will be amidst the trees of Bothe-Napa Valley State Park. Besides trailers there will be food, beer and wine, acoustic bands, including the Howell Mountain Boys and the Hot Frittatas, and the chance to enjoy the park. Napa Landmarks is an important preservation group that recently succeeded in blocking the demolition of Napa's Deco-era Post Office, among many other accomplishments. The event will also draw attention to the park, which has been operated since the state park crisis of 2012 by Napa County Regional Park and Open Space District and Napa Valley State Parks Association. Dan Cutright, organizer of the Hitch-Up, is a new board member of the group and longtime trailer fan, since his childhood camping with his family on the Russian River. "It was like summer camp on wheels," he says. Inside and outside Dan Cutright's 1954 Traveleze. Photos: courtesy Dan Cutright and Douglas Keister. 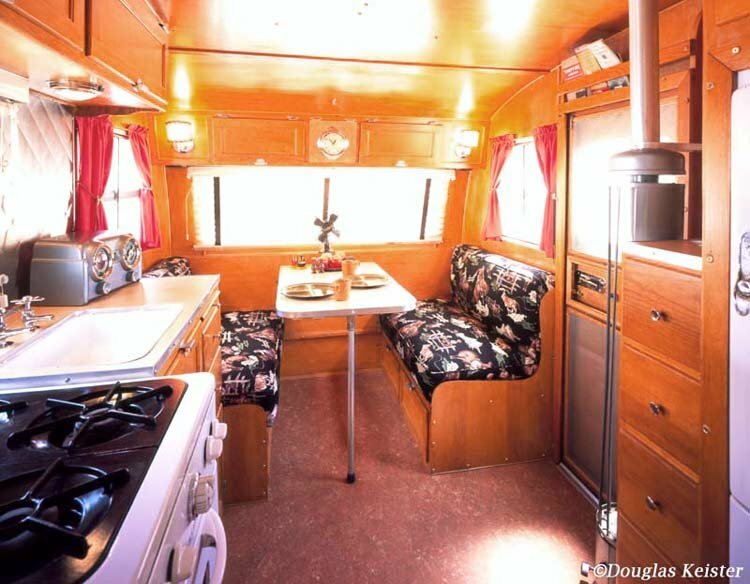 Today he owns a 1954 Traveleze trailer, rescued from the high desert and lovingly and painfully restored, so beautifully done it was included in photographer Douglas Keister's book on trailers, Silver Palaces. "In the parlance of vintage trailers, it looks like a canned ham on its side, as opposed to a bread box. It has sleek lines characteristic of the late 1940s through the '50s," Cutright says of the trailer. Why do you like it, Dan? "That's a good question," he says after a laugh. "Nobody ever asked me that before. I actually love it. Not only is it fun to camp in, it is also nostalgic." "There's a cocoon effect, you feel cozy in them. Ours has a wood interior for a cozier feel. It's like a cabin." "Lot of companies were producing trailers after the war," he says. "There were some before, but it really got into high gear after the war, when the factories were converting back to civilian use." It was also a time when families began taking to the road on newly built highways. Vintage trailers are increasingly popular among the general public, Cutright says. "Vintage trailers, teardrop trailers began showing up at classic auto shows. They sometimes get more attention than the cars because you can go in them." "We're going to have a good mix," he says of the show. "We didn't want it to be all old Airstreams," he adds, noting that Airstreams are more common today than their competitors because they were, in general, better made. The oldest will be "a rare 1935 Covered Wagon. It's pretty cool. It's pretty original and pretty unique." Also open for touring will be a 1950s Airstream and an Aljoa camper from the mid-1950s. "Some are slightly more modern," he says, mentioning "a Ken Craft from the 1970s. It's a very mid-century modern feeling when you go into it—the light fixtures, the color combinations, the architecture. It feels like you're walking into a 1960s cocktail lounge." For more on the August 22 'Vintage Trailer Hitch-up,' click here.